The Dian Fossey Award is an annual award at Lawndale High, given to graduates with great academic achievement. It gets its first and only mention in Is It College Yet?. The award is a gorilla posed like Rodin's The Thinker. The origin of the award is a mystery. The name implies either that the Dian Fossey Gorilla Fund are patrons of the school/award - which doesn't fit their work - or Fossey has some link to Lawndale High. Or we're overthinking it and the writers Angela Li thought the "Dian Fossey Award" would sound more impressive. "And now, people, and now... and now, awards time! We'll do the sports and other good prizes after I get these academic jobbies is out of the way. Now, as you know, at Lawndale High we prefer to reward students for both their scholarship and contribution to student life. But, occasionally, a student does so well in one area that we are forced to recognize him or her despite crippling deficiencies in the other. 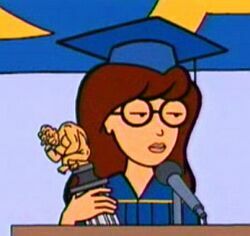 And so, I give you the winner of this year's Lawndale High School Diane Fossey Award for dazzling academic achievement in the face of near-total misanthropy... Ms. Daria Morgendorffer!" This page was last edited on 25 April 2018, at 18:51.